I Hurt But Didn’t Do Anything? Unfortunately, pain and injury are an inevitable fact of life. In some cases this pain occurs following a traumatic event such as rolling over on an ankle or falling on an outstretched arm. Of course we aren’t happy about these injuries, but at least they make sense….. “I’m in pain because of the trauma I experienced”. But this is only one type of injury. In other cases you can hurt and be in pain without undergoing a specific injury or accident. Maybe you just noticed some minor symptoms one day that got worse instead of better with time. Or maybe you started feeling pain after doing a routine activity that you have done countless times before. Perhaps your back hurts after simply bending forward one day, or you knee hurts after a run even though you have been running for years. Let’s take a few minutes to talk about this type of “injury”. As a side note… Please consider that this brief article talks about pain that arises from some form of tissue injury. But keep in mind that pain is a complex and often poorly understood entity. Pain can also be driven by other mechanisms, such as medical/non-musculoskeletal problems, or in some chronic pain situations can occur even in the absence of tissue injury. What I am talking about here is pain that occurs as a result of tissue damage (which which accounts for the majority of cases we see in our office). 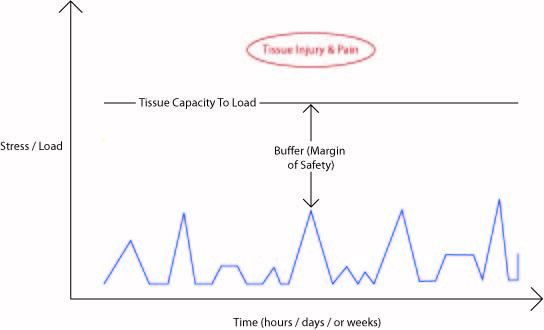 To understand any injury we must first understand that all of the tissues in our body (and here I mean any biological tissue such as muscle, tendon, ligament, bone, joint cartilage, and even our nerves) have what is referred to as a “load tolerance”. This is the amount of stress any particular tissue can withstand before the tissue yields. For example how far can a ligament be stretched before damage occurs, or how much force can a bone withstand before it breaks. Simply stated, if your body is subjected to forces that are beyond a tissue’s tolerance level, that tissue sustains damage. Of course this will make perfect sense when talking about a traumatic injury such as an ankle sprain. Image yourself running along and you catch your shoe on some uneven ground. The forces associated with all your body weight coming down onto your twisted ankle is more than the muscles and ligaments can handle and tissue damage occurs. But what about those times when pain and injury occur but there is no specific trauma or single precipitating event? 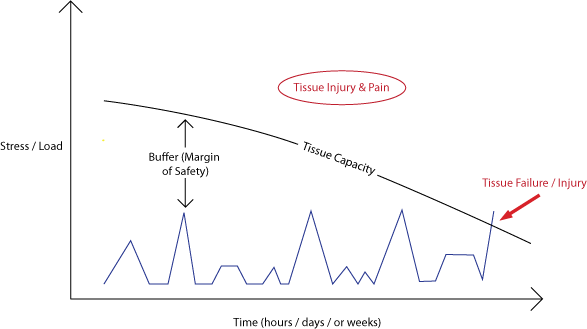 Interestingly, in non-traumatic injuries (the “I hurt but didn’t do anything” type of injuries) the injury process is the same, but instead of the overloading forces occurring all at once they occur as a result of long-standing, low-level forces accumulating over time. In other words, instead of a single traumatic event, repeated “sub-threshold” forces can slowly disrupt and damage tissue over time. If this process continues at some point the tissue yields, leading to pain and symptoms. To appreciate how this actually works realize that our bodies are under continual physical stress throughout the day with activities such as standing, walking, bending, lifting, and even sitting. Fortunately these stresses are typically well below our tissues’ tolerance levels, meaning our bodies can easily withstand these loads without incurring any significant damage. Essentially there is a “margin of safety” or buffer between the stresses our bodies are subjected to and our bodies capacity to tolerate that stress. The key phrase here is “any significant damage”. Even though these lower level loads are well below the failure stress of any individual tissue they can still still create low level micro-damage. Under normal circumstances the body is easily able to repair and recover as these stressed are removed. Exercise is a good example of how this principle works. When we go the gym and lift weights we are selectively and purposefully stressing our muscles. As we remove these stresses (i.e., when the workout ends) and when we allow the necessary time for recovery our tissues adapt by getting stronger. Our tissues are then better able to tolerate the stress if and when it occurs again. We have thus improved the tolerance of those muscles. It is now able to tolerate more stress. It becomes more resilient. But here’s the critical factor…. For this positive adaptation to occur we must allow adequate recovery time between training sessions. That is why we don’t typically train the same muscle groups everyday. But imagine we were to violate this principle and we went to gym and did biceps curls every day. Without the needed recovery between workouts microtrauma would start to accumulate. Instead of getting stronger the health and integrity of the tissue starts to slowly deteriorate. If this continues at some point the damage will build up to critical mass at which point pain and symptoms develop. Maybe some symptoms just shown up on day, or maybe your feel a pain in your biceps after lifting up your kid or opening a heavy door. Either way, tissue damage has accumulated to the point of injury, but as you can see this “injury” has actually been slowly building for some time. So What Do Biceps Curls Have to Do Your My Injury? So what does all this have to do with why you hurt? Simple. Just replace “biceps curls” with any sort of activity you are doing on a regular basis. Maybe your a runner, swimmer or crossfitter who one day starts to hurt even though you’ve been training for months or years. Or maybe you do a lot of bending or lifting at work and suddenly one day your back hurts. When this happens more often than not it probably means you’ve been flirting with that buffer – that ever narrowing “margin of safety” between what you need to do and your body’s capacity to do it safely. Just like the example above, you’ve been doing too many biceps curls without the needed recovery. 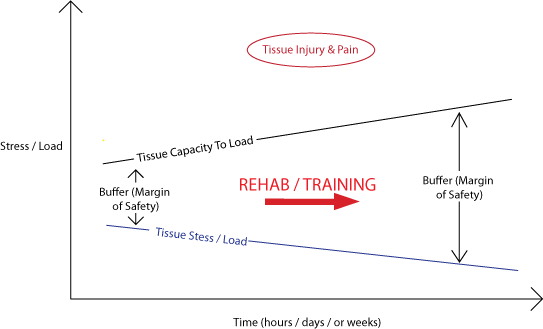 Treatment and rehab can can a complicated topic, but let’s simplify this by returning to the idea that injury occurs tissue stress exceeds tissue tolerance. In other words, when we lose the “buffer” between what any particular tissue can tolerate and the stresses imposed on that tissue. So in this context treatment is directed at restoring and increasing that buffer. This is done by addressing both the injured tissue itself, as well as the addressing the offending mechanism of stress/overload. As for the injured tissue itself we need to both guide the healing process to ensure that the heals as quickly as possible, and heals properly. Depending on the degree of symptoms and the extent of the injury this may include some basic range of motion exercises and isometric contraction exercises to help manage pain and guide tissue healing. 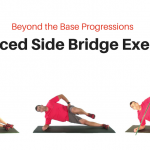 These exercises are critical to prevent the area from further tightening up and to guide the cells into laying down new collagen fibers in the right areas and directions. 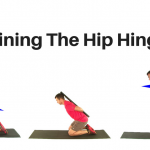 As healing continues higher level exercises can be prescribed to strengthen the area. Essentially we are trying to improve the capacity of the tissue. Remember injury occurs when the capacity of a tissue is less that imposed demands. So we don’t just need to get the pain to improve. 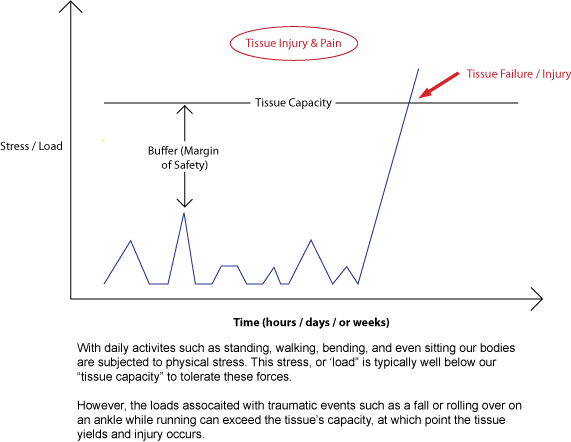 We also need to improve the capacity of the tissue to meet the demands that caused the injury in the first place. Just because symptoms improve does not necessarily mean that the tissue is healed and ready to resume full activities. In addition to dealing with the injured tissue, we also need to address the offending mechanism of stress/overload. In other words, we need to try to reduce the load/stress on the tissue. Some of this may be done in a short term capacity, for example temporarily reducing running mileage or avoiding certain things at work or at the gym. It is also common for biomechanical issues to need to be addressed. For example, heel pain may be related to a restricted ankle or foot joints that may be putting more stress on the plantar fascia. Knee pain may be related to tight or weak hip. When this is the case, correcting these offending biomechanical issues can be a critical step in reducing stress, getting the patient back to full activities as fast as possible, and helping to minimize re-injury.